Sports Costs > How Much Does a Racquetball Court Cost? How Much Does a Racquetball Court Cost? If you’re interested in building a racquetball court, you may have two options: you can either hire a contractor or there could be a turnkey option which allows you to install the court yourself. An exact estimate for a racquetball court can be so hard since so many factors come into play. Will the court be indoors or outdoors? If indoors, you have to consider the walls, flooring, glass walls, doors, lighting and accessories. Researching online, it’s safe to say you should budget at least $30 to $40 per square foot for a simple court made of concrete with a steel frame. Using a home-based court, here’s what the process would more than likely look like: the land, if necessary, would have to be cleared so the foundation could be set. Once the foundation is set, about 800 to 1,000 square feet of concrete would be laid to create the floor. From there, depending on the wall height, another 2,500 square feet would be needed to form the concrete wall, bringing the total square footage to about 3,500 square feet. Using the numbers above, your court could cost close to $100,000. This wouldn’t include any fencing, painting or speaker is needed. With so many customizations, the prices can be all over the place. The estimated costs mentioned above for installing the racquetball court will only include the standard dimension of the court and the court floor. The floor materials will vary depending on your choice, but the most common materials can include siding, brick and metal-based siding. Common options may include a short three-wall, long three-wall or a short/full-back four-wall. 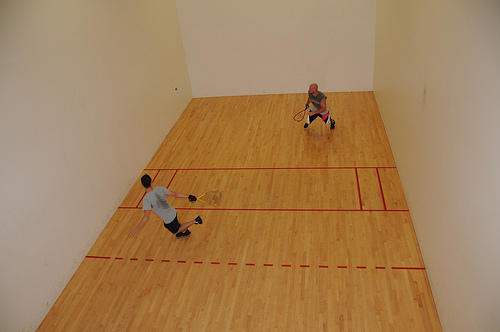 Racquetball court dimensions should be 20’ wide x 20’ high x 40’ long. Players commonly prefer concrete courts with panel and glass backs. Before the project begins, you will have to factor in fees such as the architecture and the contractor fees. These fees alone can be 25 percent of your project costs. The more walls you add, the higher the costs may be. The same can be said with the wall height. Common accessories added to courts include lights for nighttime play and speakers. Indoor court fees will be much different than an outdoor court. For instance, indoor courts will often span two floors and will require glass wall panels and special flooring such as maple. Indoor courts will also need steel galvanized studs and ceiling joists to prevent them from rotting. Talk with at least three contractors before choosing one. Try to get as many references as possible, and also try to read as many reviews. Comparison websites, such as HomeAdvisor.com, can help you get multiple quotes in your area for free. If you have the skills, consider turnkey companies. These companies will provide you with all the materials and blueprints necessary. As you can see above, if you have the skills to do the job on your own, highly consider being the project manager or trying perform some of the jobs on your own.